This page is provided for information purposes only and does not necessarily reflect the views of the Rogers Lake West Shores Association Board. 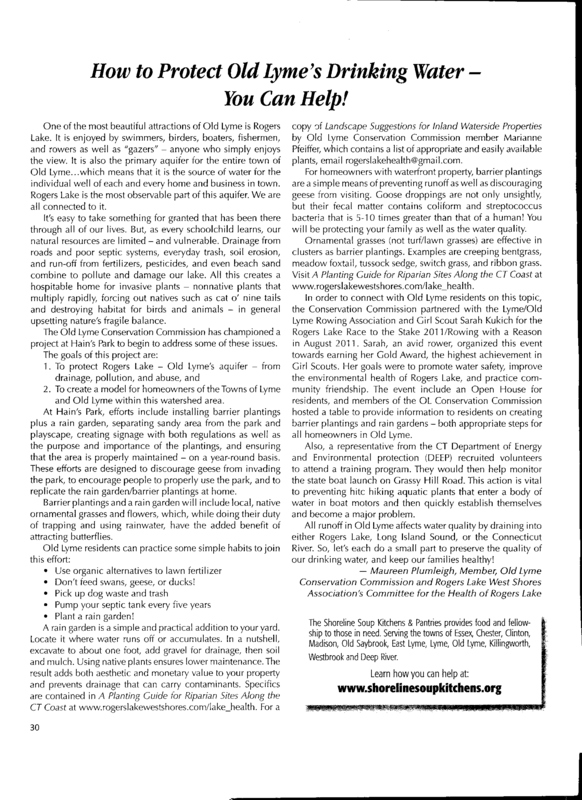 Any questions about the content of the Lake Health information should be addressed to Maureen Plumleigh at rogerslakehealth@gmail.com. Please note: A new state law (12-155) that prohibits the use of a fertilizer containing phosphorous near water bodies is now in effect. A $500 fine is imposed on violators. A pound of phosphorous fertilizer can produce 10,000 pounds of algae in water bodies like Rogers Lake! The state Department of Energy and Environmental Protection reminded residents this week to be on the lookout for invasive Oriental bittersweet this holiday season, and to avoid using or selling it in holiday décor. Oriental bittersweet, sometimes used in wreath-making and other holiday decorations, is a woody vine that produces bright red fruits with yellow outer coverings. Use of the vines helps spread seeds to new areas, and once established in natural settings, the vines can wrap around trees, strangling them. The extra load on the tree limbs can cause limbs to fail, contributing to damage and power outages. Improper disposal of the decorations, either outdoors or in compost after the holiday season, can contribute to the spread of this highly invasive species, DEEP said in a news release. Selling or moving bittersweet is prohibited by state law. The prohibition extends to seeds, flowers and other reproductive portions of the plants. Fines for violations are $50 per plant. Anyone who finds invasive bittersweet for sale in Connecticut is asked to contact Logan Senack, Connecticut Invasive Plant Coordinator, at (860) 208-3900 or at: logan.senack@ct.gov. For information, visit: www.cipwg.uconn.edu. From the Fall 2011 edition of Old Lyme Events is the article by Maureen Plumleigh, resident of RLWSA and member of the Old Lyme Conservation Commission.